Maybe you’ve had a similar experience to me — every so often the distant nightmare of climate change breaks through. I read or watch something, I’m shocked, I do some things, I hope the Government is responding adequately, I get pulled back into the demands of my life. And after a time — repeat. I don’t particularly want to think about climate change. I don’t really think of myself as an environmentalist. What can I do anyway? I like being a mum, I like supporting parents of teenagers, I like my work, listening to the radio, gardening and drinking tea with friends. But recently it has become clear that we have entered a new, very urgent stage in tackling climate change and protecting our natural world; that we cannot carry on as usual any more; that there is no other alternative but for everyone to face the emergency we find ourselves in, and to act from that point. We have to face that we are in a state of climate emergency — that we have maybe five years (plus or minus a couple) to dramatically reduce greenhouse gas emissions, to have any chance of preserving the world as we know it. The UN IPCC (United Nations Intergovernmental Panel on Climate Change) report[i] published in 2018 said the world has 12 years to halve greenhouse gas emissions to have any chance of limiting global warming to 1.5 degrees (to be clear, this is action on a scale the world has never seen before, similar to a ‘Marshall Plan’ in every country). However, the report has increasingly been criticised as a conservative compromise, and respected scientists are breaking ranks to issue serious warnings that we actually need to act much more quickly[ii]. It is important to face this shocking information as boldly as we can. Without facing this, we have little hope of responding adequately. In 2018 there was clear evidence of the effects of climate change around the world, which broke through into people’s consciousness in a new way. Despite this, the extent of the crisis is barely reflected in the media, the Government response, or in our daily experience. Our Western lives keep us busy, entertained, distracted, exhausted, numb and ‘asleep’ to the reality that is approaching. There is a sense that we are sleepwalking towards disaster. There are hundreds and hundreds of amazing, positive, innovative ideas and projects that address the environmental crises, and most of them move us forward as humans too, we have so many of the answers we need; but we don’t have the necessary political will, and we have very nearly run out of time. There have been fantastic efforts to ‘transition’ us out of global dependence on fossil fuels, to work towards a peaceful and empowering switch to clean, green energy — much has been achieved and will make a difference. But it has become clear that fossil fuel and extractive capitalism won’t just roll over — it doesn’t know how to stop, and it probably can’t by itself. It is not a thoughtful and responsive system; it has one setting — extracting fuel and natural resources to make money. The fossil fuel industry continues to receive trillions of dollars globally in government subsidies, even as we approach the cliff edge[viii]. We continue to be urged to consume more and more. Despite scientists talking about the possibility of the collapse of human civilisation[ix], emissions actually increased last year and will again this year. It is more and more clear that saving people and planet will take up-ending fossil-fuel capitalism and changing our entire system — and we are approaching this confrontation in the next few years. The more of us who are awake to the emergency we face, the better chances we have. It’s impossible to know exactly how things will play out. Climate science is one of the most complicated areas of science, because of the complex range of interconnecting factors and systems — think of the poor scientists trying to predict cloud behaviour… However, so far the observed effects of climate change are coming in at the more severe end of scientists’ predictions, and it is almost certain that we will see dramatic impacts such as widespread food and water scarcity, very large numbers of climate migrants, extreme temperatures, increasing species extinction, storms, wildfires, and possibly much more within a few years. In addition to the increasing effects of climate change, we can expect significant ongoing instability in other ways too. The end of the cheap fuel economy will probably continue to cause political tremors across the world; one of the possibilities is that the financial system could collapse because of its links to a collapsing fossil fuel industry[x]. There are other big possibilities too. As uncomfortable as it is to think about all of these things, it will be a great help to us, and others, if we have had some chance to engage with the fact that big changes are coming. It will help us to respond thoughtfully and courageously to the challenges we confront if we have had a chance to face the emergency we are in. It allows us to process and understand that we have moved beyond ‘business as usual’ — that a lot of what has been presented as ‘normal’ in our economic system can no longer apply. It allows us to begin considering other ideas. Confronting the emergency also stops us being so vulnerable to manipulation, so shockable and less likely to blame scapegoats. It allows us to make important changes to our lives, and to develop the local networks and communities that will be essential. Information and understanding gives us more power. All of this is really hard to engage with, and it can be terrifying and incredibly sad. It is completely normal to feel huge grief, fear or other emotions when we try to understand the situation and what it could mean. The implications for our children’s lives, or other people’s children. Or our own life. The loss of species. Or maybe even the loss of some of humanity’s greatest achievements and dreams. Our feelings are central to our humanness, our intelligence, and to our caring for each other and the world, and we need space to absorb in every sense what this situation means. If we don’t allow ourselves to feel, we often remain distant, and the emergency continues to be ‘unreal’ to us. We may also feel ‘discombobulation’, as we absorb that so much of what has been the normal parameters of our life may no longer be relevant. Sharing our feelings and thoughts with others is so important. When we keep them to ourselves, they can morph, dominate and terrorise us; talking with others means we literally ‘share’ the feelings and experience — we are no longer dealing with them alone; we can confront pain or fear, and understand their true proportions; and it brings us closer. We begin to understand that we are all in this together — and if anything will get us through this, it is solidarity, bravery and togetherness. For myself, trying to personally grapple with our situation is very hard, and very useful. At times I feel grief-stricken, terrified, shocked and disbelieving. I can’t stop thinking. I cry for what my children may face. I struggle to make sense of it, and am unable to sleep. But I also feel braver, clearer about my life and what I need to do, and more aware of the sweetness of every moment of life and the preciousness of all human beings. And I take heart that I get to fight; we don’t have to be passive, we can actively struggle for the best outcome we can get. The current situation could also bring opportunities to create a fairer, more caring and united, and less grimly productive world — even as we deal with the effects of ecological crises. The end of fossil fuel and oil power, and the unceasing focus on consumption could be good for us all. But this requires a boldness and forethought that only comes from many people having faced head-on the emergency that we are now in. 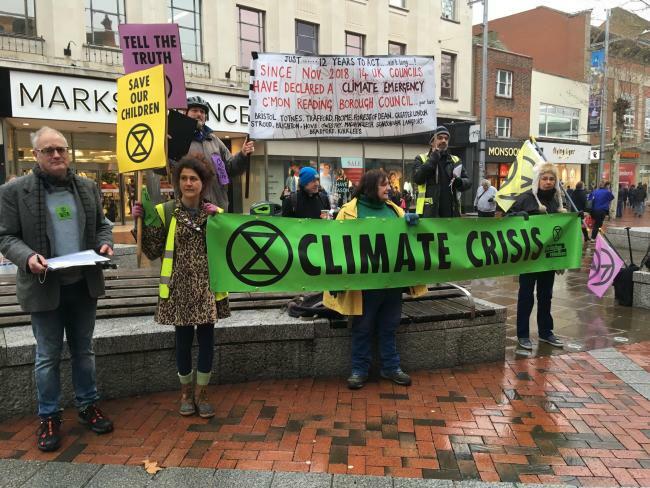 The next thing is to talk about the climate emergency. The lives of our children, future generations and much of life on earth depends on how we respond in the next few years, and this largely depends on how many of us are ‘awake’. And then, move to action. How do we act in a way that is consistent with the emergency we face? How bold can we be? What is our particular part of it? How can we join the movement calling for the necessary immediate and dramatic global reduction in emissions and protection of the natural environment? Thank you for reading. I know this isn’t easy to think about. Thank you for thinking about it. Please share your thoughts, with me, or somebody. With thanks and appreciation to all of us as we try to do our best in responding to the situation we find ourselves in. Solidarity and love. And take direct action — see you on the streets!